Failed Democrat Florida gubernatorial candidate Andrew Gillum met with former President Barack Obama in Washington, D.C., Tuesday amid talk the progressive is considering a run for president in 2020, according to CNN. Details of Gillum’s discussion with Obama are unclear, while press representatives for the pair declined to comment on the meeting. 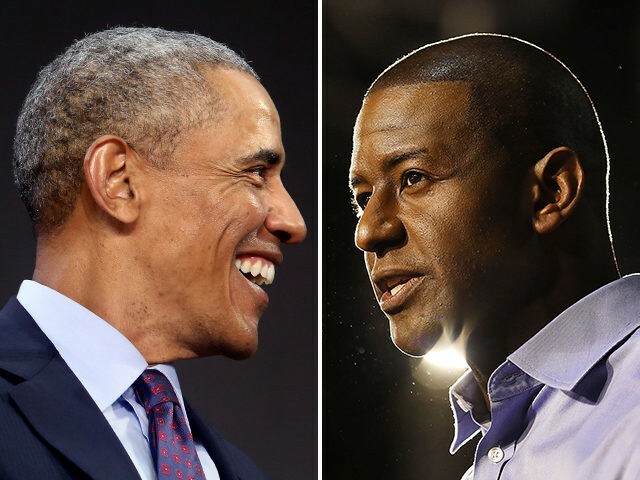 Obama endorsed Gillum to be the next governor of Florida, citing his staunch commitment to expanding Medicaid and position on climate change. Reports of the meeting come after Politico revealed Wednesday that former Democrat Massachusetts Gov. Deval Patrick, a close ally of Obama, will announce as soon as this week that he will not seek the presidency in 2020. Gillum is not the only rising Democrat star to meet with President Obama. On Tuesday evening, The Washington Post reported failed U.S. Senate candidate Robert Francis “Beto” O’Rourke met with Obama on November 16, as the Texas Democrat also considers a run for the presidency in 2020. The progressive congressman said recently he isn’t ruling out a possible run, walking back earlier claims that he wouldn’t seek the highest office in the land regardless if he won or lost against Republican rival Sen. Ted Cruz (R-TX). Aside from meeting with Gillum and O’Rourke, Obama has sat down with other potential 2020 candidates, including Sen. Elizabeth Warren (D-MA) and Bernie Sanders (I-VT).